In Kim Stanley Robinson’s new novel Red Moon the first few pages describe a method of Earth-to-Moon transportation that I had not encountered before. The idea is to use a magnetically levitated and accelerated train on the surface of the Moon to catch a spaceship from Earth flying by the Moon at thousands of kilometers per hour. The advantage of this system is that the spaceship does not need to bring fuel to decelerate itself and instead is decelerated by the train. In more detail, a ship is launched from Earth and is put on a course tangential to the surface of the Moon such that it would just brush past the surface at 8300 kilometers per hour (according to the novel). As it approaches the Moon a maglev train on a 200-kilometer long track is accelerated to match speeds with the incoming spaceship. As the ship comes closest to the surface of the Moon the train is there to catch it and hold on to it. The train then gradually decelerates with the ship using the long track. Because the train is magnetically levitated and there is practically no air resistance on the Moon the train can easily reach such fast speeds. Because the ship doesn’t have to bring its own decelerating fuel much more weight can be dedicated to cargo. 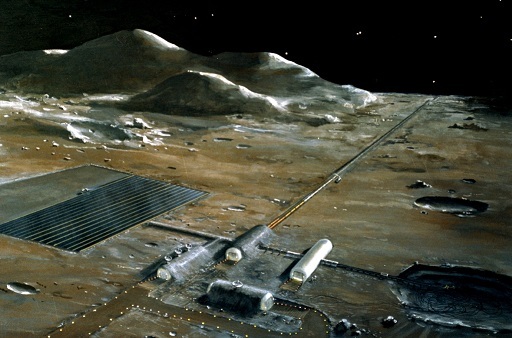 This system is very economically attractive and if practical would appear to cut costs of sending people and supplies to the moon significantly. However, I have never encountered this idea before and a cursory search doesn’t find any other references for the system. Will this scheme work or are there practical difficulties that make it unfeasible? P.S. I'm also curious whether this is a novel idea of Kim Stanley Robinson's or if someone else has proposed this before? 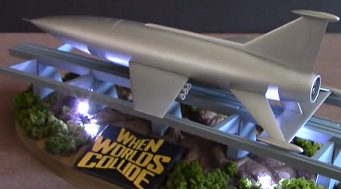 It's a clever reverse on the old railgun-up-a-mountainside launcher concept. There are a few practical difficulties. For one, we can barely build fixed railway infrastructure capable of 400 km/h, much less 8300. Most current maglevs run slower than that, and it's not all due to air resistance. Turns out that a 1-2 cm error in surveying and construction and otherwise minor variations in magnet strength leads to a really bumpy ride. There is no reason to expect kinetic problems to decrease as the speed increases. Maintenance gets much more expensive as speeds increase, too. Another other big practical difficulty is the same one faced by missile-interception: Two very fast masses that must meet precisely. 8300 km/h is 2.31 km per second (barely short of escape velocity 2.38 km/s, so a rounding error might make a big, er, impact). In order for a 1m docking grapple to catch properly, both craft must reach the same target spot less than 0.0004 seconds apart. Let's go back to the guideway. It must contain the train-plus-grappled-spaceship forces vertically and horizontally. And sometimes that vertical force might be high-impulse, or strongly oscillating as the combined vehicle stabilizes in the seconds after grapple. Seems like a big fraction of your power must go toward simply holding the train in place vertically on the guideway against those unexpected vertical forces...lest it get torn off and dragged into space (or smashed into the guideway) by that pesky rounding error in the spaceship's vertical vector. Finally, the biggest problem is that there's just no way to make this thing fail safely under lots of conditions. 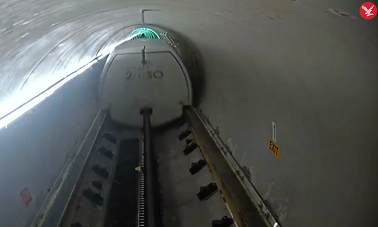 Any kind of guideway failure would be catastrophic. A power disruption while the train was in motion would be catastrophic. A tiny mistake measuring the spaceship's position or velocity would result in missed meets (and a massive waste of energy)...or a catastrophe. Fail to brake and the train will leap up many kilometers high. It will take some minutes to fall on the ground again at an extremely high speed. 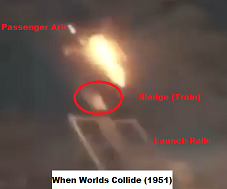 In fact, if the ship collides and imparts momentum to the train, the train may even escape the Moon. To be stuck to a planet while flying this close or over its escape velociy requires an immoral amount of downwards force. Both the ship and the train must be made of an unobtanium-adamantium-uru alloy. Why do you need the train? The other answers make the very good point that even the smallest error would lead to disaster even if everything else could be made to work. But, unless you are aiming for an improvised Mission Impossible kind of scene (in which case anything goes), then the train is redundant. Here's what you could do: instead of a fixed-width maglev track, build a sequence of toroidal magnets along a very elongated horizontal cone. Give the first one a one kilometer diameter and make the last one just wider than the spaceship. The ship flies through the first one, gets slowed down slightly and its course is corrected towards the central axis. The next one slows it down further and corrects the course again, and so forth. By the time you're on the last one, your ship is centered and slow enough. Sadly, there are a bunch of reasons why this still wouldn't work. Just generating a magnetic field with meaningful strength over a large volume would be prohibitive. The volume energy of magnetic field is $B^2/2\mu_0$, which works out to $10^7/8\pi\>\> J/m^3$ for 1T field. Calculating the total energy inside a $100\:km\times1\:km$ cone is left as an exercise for the reader. As is the energy that would be deposited on the spaceship during the deceleration, and the stresses on the toroids, and the outcome of an approach that is just a bit too off-axis, and just how the deceleration and course corrections work, and... Nope. Sorry, no. I saw after posting that Kyle essentially proposed the same approach and even worked out the answers I was too lazy to calculate. I yield to you, sir. This is part of a larger system. The track is wrapped all the way around the equator. This gives you plenty of time to get the system up to speed and match with the target spacecraft. While you need sub-millisecond accuracy you have plenty of time to match the capture train to the spacecraft--the match should not be a problem. This also removes the failure-to-stop failure mode. If you have a problem you can just keep going. The spacecraft is grappled with long connectors. The spacecraft is in an orbit with a very low periapsis but it's not going to plow into the moon if a mistake is made. Fail a grapple and you just go around again. Maglev trains are speed limited by being in atmosphere. You have no issue of wheels on a track, no issue of pushing the air out of the way. Going 2000 m/s instead of 100 m/s isn't going to be a big problem. The whole system is safer if the train is actually moving above orbital velocity. (Note that the ends of the grapples inherently must be above orbital velocity, having the train itself above orbit is no problem.) The way you keep it from flying away is that it has 4 rails rather than the usual two. This can either be actually above the train or the train can have a piece that reaches down between the rails and rides on downward-pointing rails underneath. Mechanically the latter is simpler but I don't know if the magnets could be kept from interfering. In use, the train gets up to speed and then adjusts it's speed so that it will arrive under the spacecraft as it reaches periapsis. To be simple but wasteful you could simply keep the train directly under the spacecraft. The grapples are launched upwards. If they fail for whatever reason you just wind them back in and try again next orbit. If they grapple the spacecraft is first pulled into a circular orbit and then winched down onto the grapple car where it is more solidly connected for the deceleration phase. Note that I said this was part of a larger system: This track is useful for a lot more than landing spacecraft. Since the train exceeds orbital velocity it can be used for launch as well as landing. Not only that, but if you build it beefy it can generate some pretty high velocities. Orbit is 1.73 km/sec (at 100 km, I'm having zero luck finding it at 0km) which generates 1.62m/s of centrifugal force (matching the lunar gravity.) Lets speed our train up so the spacecraft feels 1g outward. Now it's moving 12.2 km/sec. Release it and it leaves the moon with more than 10 km/sec of velocity (remember Oberth, don't just subtract the escape velocity.) Very few NASA craft have exceeded this--but this is nowhere near the limit of this system. Lets take it up to 5g, about as much as we want for a manned launch. Now it ejects with 54 km/sec and loses almost none of that to the moon's gravity. That gives you anything from smacking the sun to solar escape. Unmanned missions can be launched even faster. This is literally every on-orbit docking maneuver ever. The above answers cover most of the important aspects, but the consensus that this is borderline impossible is slightly silly. You'll still need a fair bit of fuel on the spacecraft as it's primarily responsible for lining up the rendezvous, the train can only speed up or slow down and as the vehicle closes in it's going to have all six degrees of freedom. If any inclination changes were required you'd need to load up on fuel, but your particular use case addresses that. 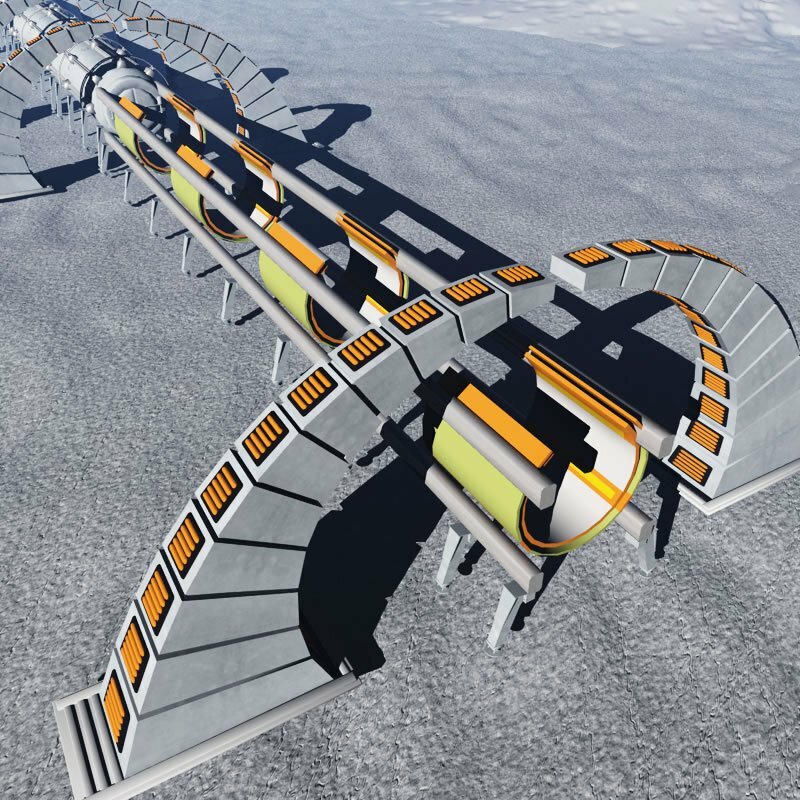 As for not seeing this anywhere, when I was looking into Launch Loops (basically using a self suspending linear accelerator - maglev train - to launch payloads directly into orbit) I discovered that on Earth this is possibly a worse idea than a space elevator. Which takes some doing. But on the Moon, you can have an accelerator on the surface and lob payloads directly into a very elliptical orbit, and just circularize at apogee. If you don't circularize, then the payload comes back and skims the surface at perigee - potentially a bad day. But that's the whole point of what you're up to, run the launch process in reverse and you're good to go. Some of the above answers brought up some valid concerns about the rail portion of your system. However, these problems are primarily control engineering challenges that, while very difficult, are probably solvable with enough time, money, and incentive (I can think of some big programs with plenty of time and money that don’t seem to accomplish much, so #3 is important). I’d definitely recommend you consider why your people had both the reason and means to solve such a tricky problem. Partly a direct answer to the secondary question, P.S. I'm also curious whether this is a novel idea of Kim Stanley Robinson's or if someone else has proposed this before? This reportedly was first proposed as a concept of an "induction catapult". in the 1966 Robert A. Heinlein book The Moon Is a Harsh Mistress. 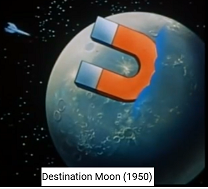 However there is prior art most likely driven via The First Men in the Moon which in turn was based on De la terre à la lune (From the Earth to the Moon) an 1865 novel by Jules Verne. Thus I would say the theory "evolved" from that classic. However the closest previous physical example could be the one way usage in "When Worlds Collide"
It reportedly is only intended to work from ground to "The Gateway" (a cisLunar Orbital Platform-Gateway) thus not Earth, such that the speed gravitational forces etc are MUCH lower than implied by the book. Also lunar spin may or may not be a significant factor. If the book is to be taken as an Earth to Lunar base journey then we have to go with those forces parameters etc. I did not notice anyone mention you can reduce the relative velocity required by the Lunar Surface rotational speed of very roughly 16 km/hr near the tilted equator (I can't find a given maximum kph, perhaps someone can confirm). "Suddenly their seats rotated 180 degrees, after which Fred felt pushed back into his seat. Not much reduction from 8300, I grant you, but in this case every bit helps. The greater factor is HOW we interpret the given parameters. From the book "but going as fast as they were, something like 8300 kilometers an hour at touchdown, their ship would have to decelerate pretty hard for the whole length of the track. And in fact they were still being decisively pushed back into their seats" I will "assume" in very simple terms, 8300 is the space craft Terra-Luna relative velocity. And one could be very generous and allow for the moon receding at an orbital average of approx. 3600 kph although that was not the tone of the statement. However it could be construed from the authors quote "it meant they had come in around forty times faster than a commercial jet on Earth landed" approximates to under 5000 kph, for this arguments sake lets reduce that to 4700 kph (=8300-3600), much more practical (and feasible) for these discussions. As a result of other comments and further corrections, this results in a very generous minimal velocity (only at some times in the elliptical year) of approx 1.3 km/s. So EVEN IF the train could start instantly at that speed (but it would need some significant energy input negating the supposed benefit), over the remainder of stated 200km (max) it would need to decelerate at -55 m/s^2 (well over. 5g), I don't know how to prove the g forces involved (since the book says gravity is only 16.5%) However I can now reduce my guestimate that by the time a human hit the station if they were very fit, a percentage would probably survive (But I'm not going). Cargo including eggs, should be ok, but that's another question 🙂. To reduce g forces to a couple of g My calcs suggest a minimum 500 Km landing track is needed. "they were landing on the moon! It was hard to believe they were really doing it. “Hard to believe,” Fred said. Ta Shu smiled. “Hard to believe"
While the other posters have provided excellent answers regarding the difficulty, what we are really looking at is a reversal of the mass driver on the moon used to launch payloads. Taken this way, and not as a train, it is doable, if somewhat hair rousingly challenging. Perhaps unmanned cargo pods would be a more reasonable use of the system (which also reduces constraints due to deceleration forces on the human passengers. Essentially, rather than trying to land a payload on a moving train platform, the pod simply is aimed at the throat of a large diameter funnel, which is the mass driver. As it passes each coil, the pod passes through a magnetic field and, much like the wire on a generator, generates electricity, which is gathered by the mass driver infrastructure and stored in giant capacitor banks, madly spinning flywheels or whatever other electrical system is in use at this time. Since it is an unmanned pod, the system could be as short as 200m (see here), while a manned pod might be tens or even 100km to reduce the deceleration or acceleration stresses. When the pod has slowed sufficiently, it can then "land" on a track, but for the majority of the journey it will be suspended in the magnetic field and not physically touching anything. Your massive maglev train is, obviously, levitated and accelerated by (electro) magnets, and must be many times the mass of the spaceship. The energy to power those magnets must come from somewhere on the planet, like a nuclear power plant, or perhaps by solar energy. There won't be any fossil fuels on Mars, and although nuclear fuel might be shipped from Earth, other forms of fuel would not be; that would defeat the purpose. The obvious solution, to me, is to put both the nuclear power plant and the electro magnets into space, a few million kilometers from Mars. The same magnetic energy used to lift and accelerate this giant train can be applied to the ship itself over a very long distance in space, and you won't have to deal with the problem of tolerances on an uneven and possibly shifting (and definitely rotating) planetary surface. In space, you don't have to deal with confounding force factors like the moving Martian atmosphere (it is thin but there is weather), terrain, Martian dust storms and compensating vectors for planetary rotation or curvature. It is a cleaner and simpler environment and for engineers, this allows much greater accuracy and closer approaches, tiny nudges from steering rockets can change course by a hundredth of a centimeter. So your ship can navigate to the same distance from the rails, the rails are the same length as those on Mars (and could be shorter, because in space you could have six rails circle the ship at the points of a hexagon), the power applied is the same. But the rails can be perfectly straight, the path of the spaceship perfectly straight and centered. The rails themselves can be linked into a ring, to keep them aligned. They can be as massive (or much more massive) than the train; iron is very cheap in space (asteroids). With the nuclear power plant, any shift of the deceleration rig can be corrected by nuclear powered magnetic propulsion (accelerating atoms at near-light speed in the opposite direction of desired travel). After slowing the ship enough, it lands by parachute, just like our probes have, or you could even guide it into orbit and (robotically) deploy only the supplies by parachute to the planetary surface. Then the ship could be turned around, and the exact same rail guns in space could accelerate it away from Mars back to Earth. It may be empty, or could carry crew and products back to Earth. However those return goods get to Mars orbit, it would certainly be less energy intensive to send just them into orbit, than it would be to send them AND the ship. By this scheme (which I invented here on the fly) the ship never leaves space, so the space ship can be just a space ship, it does not have to be engineered to work both on the ground (Earth or Mars), withstand launch stresses, have landing gear, or even be oriented for gravity, it can be, for example, a permanently rotating cylinder with centrifugal 0.25G gravity, more comfortable for human passengers (washing, sleeping, cooking, eliminating, exercising, working, etc) and more convenient for packing and storage (you don't have to net everything or tie it in place). Of course, this cylinder ship may have a centrifugal section and a non-rotating zero-G section, if zero-G is desired for storage or is useful for some scientific or technical operations. Not the answer you're looking for? 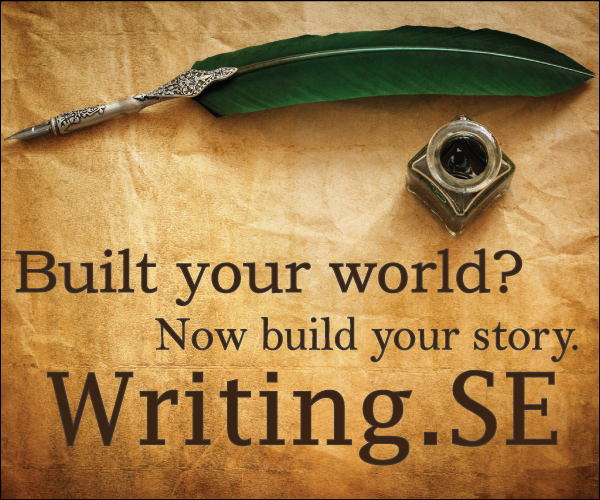 Browse other questions tagged science-based space-travel spaceships or ask your own question. Can you catch a fish with a fishing rod… from orbit? Reasons that make a spaceship forced to land at the nearest planet?